Click the 'Style Editor' button (1) to access the frame where you can change the colours throughout the eLibrary program. 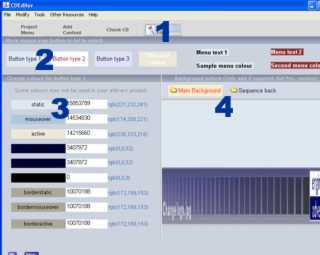 There are three button colour ranges and two menu text colour ranges that can be changed. These are not all used in the standard program but may be required in some custom windows etc. Move the mouse over the buttons (2) or text to highlight the associated colours in the list below. Click the coloured button (3) or edit the text to assign a new colour to this value. The buttons and text (2) show what the finished buttons, mouse over and border colours will look like. The first button sets the top bar colours, the second the left menu buttons and the third set the title bar text and background. The first text sample is for text menus used on the left hand side, text is used by some menus instead of buttons. The final text is used for the text and bar at the bottom of the frame. Click the main background button (4) to select a new background picture that will skin as the main program design. This will allow you to easily add your own title name to the CD project. Click the sequence back button to add a second background picture for the sequenced events only. This is not required with the fully customised pro versions.